One night, my friend Romina, Queen of the Kouing and owner of the patisserie, let me come over to help out in the kitchen. Well, actually I didn't do much. I like to see my role more as moral support than anything. But I was able to weigh out flour and sugar. Even fondle a kouing aman or two. But when she unwrapped an unctuous beige mound, I could smell it. The croissant dough. Yeasty and buttery. It's magic the way she can sing along to all the '80s tunes on 101.9FM, carry on a conversation, and cut perfect triangles of croissant dough. She weighed each out to ensure egalitarian results (croissants for all). Then, she handed me a few of the triangles and said, "try it." I watched as she gently tugged outward at the base corners and started rolling toward the fine point. These points curled up, smiling back. She gave the whole thing a good "smoosh" with her fingertips to make the outline softer. She deftly placed hers on a tray. They sat on the tray waiting to be covered with the industrial plastic wrap. They still needed a few hours of "beauty rest" to unleash their full potential. The dough, the layers, everything looked alive in definitive and sharp lines. More than half moons, it reminded me of angry crabs bearing their scowls and aggresive claws perched close to their plump armor. The look didn't beckon a "come hither." It was a distinct "you lookin' at me?!?" I'm happy to report that I don't actually "play" with the baked results. I don't march them sideways, have them joust, or send them on kamikaze missions into small tubs of jam. But, sometimes...I don't know, MAYBE they were baked in cozy conditions 'cause I swear, I SWEAR a flaky "claw" just waved up at me. Then I snap back to reality. And remember that they're simply the golden crescents described in so many cookbooks. Vanessa! Is there a food blog writing contest that we could enter this post in? It's a piece of striking brilliance (and more than a little salivation-inducing). 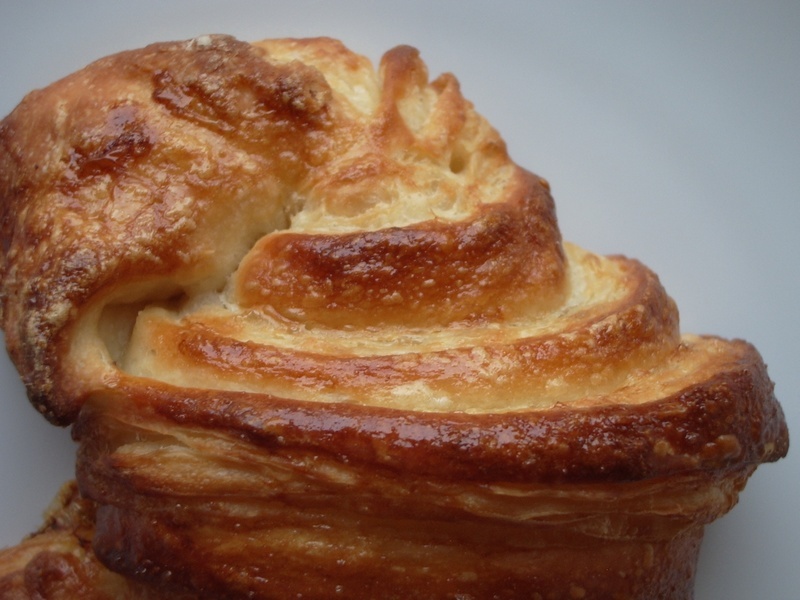 Vanessa, the photos of croissants and kouing aman and your writing are making me salivate! As another left-handed cook and a fan of Les Nubians, I salute you. Lovely aliteration! You would make Nelson Goodman proud! Nice post. Tell Lisa not to worry. If I'm going off the low-carb wagon, I'm more of a fries and fry sauce kind of binger. Kalyn—fries and fry sauce with a crown burger? call me if you're going that route. you shouldn't have to do it alone. btw, your chicken cilantro soup was SO good. Just what I needed for a cold day. Thank you! Jaay—aw shucks, thanks for the compliment :) funny though when i articulated this entry in conversation with some friends, they just looked at me as if i were cookin' the meth. but bloggers GET IT. And I am so grateful. Your site is so fun. Boiled cookies, y'all! Adrienne—Thanks! Now if only my mother would buy that and believe that all the education actually did me any good, ha! Brett—Welcome my Bay Area brotha! I came across your site in the food blog noms and I gotta say, I agree with alot of folks, the blog rocks. I still need to go through alot of your photos, but it's sparking some mad wanderlust. You may end up being the bad influence I need. I just tagged you for a meme! Much like the wonder that is Kouing Aman, these croissants are the best I've ever had anywhere. The perfect balance of crisp, yet soft texture, and rich, buttery flavor makes them impossible to resist! I echo Vanessa's assertion that Romina is a vertiable goddess in the land of pastry in Utah! mmmm... very nice. i wish i had some of your lovely croissants it would really go well with my hot chocolate right now.